Peter O'Mahony didn't play for his province last season but that didn't stop him speaking out at a staff meeting involving all levels of the Munster organisation last April. At that meeting, O'Mahony - ruled out for the campaign by a knee injury sustained at the World Cup - called for improvement across the set-up, but that wasn't the only thing he was trying to shape behind the scenes as Munster made one of the biggest revamps of their culture ahead of the 2016/17 season. The role O'Mahony played in the move to their new training centre at UL was nearly as pivotal as any job he has performed on the pitch. The Munster management needed their skipper to fully back this move so other players would buy into it too. O'Mahony was in; he constantly pointed out to his team-mates the positives of the switch. Naturally, the move to UL wasn't convenient for the Cork-based players. O'Mahony is from Cork but he was convincing players of its merit. Because of allowances given to those with a family, O'Mahony is one of a handful of players who continue to live in Cork but who must commute to training or stay in Limerick for part of the week. The effectiveness of the transition as a whole this season would not have worked without O'Mahony's support. 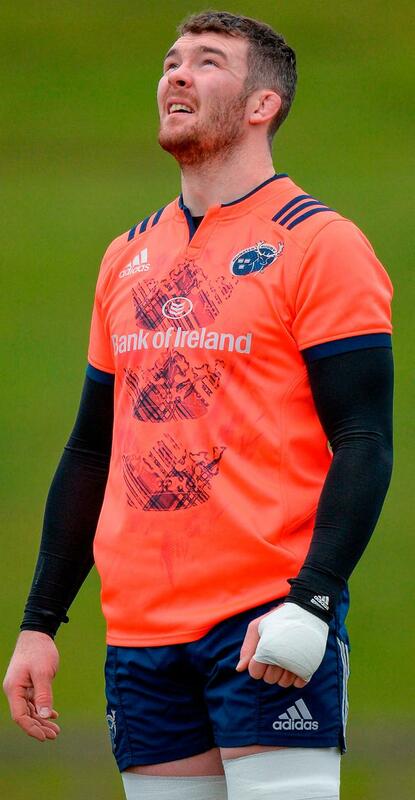 Since his previous game for Munster in May 2015, moving to the one base at UL wasn't the only change O'Mahony had experienced when he finally made his comeback from injury last October. He became a father when his daughter, Indie, was born last April. There were changes to the coaching and management team with Rassie Erasmus and Jacques Nienaber joining in the summer. And a retired Paul O'Connell was no longer playing alongside him. Even though O'Mahony was the captain for the last few years of O'Connell's Munster career, from the outside looking in, it still felt like it was O'Connell's Munster, such was his standing with the province. Now, O'Connell is gone and O'Mahony is back. His status was always going to find more space to come into its own this season. The start of a new era was something O'Mahony was invested in and he championed his team's potential at the launch of the Champions Cup three months ago. "We have a younger group, one that wants to stamp their authority on the Munster jersey over the three or four years," he said. "We take a huge amount from our history. It is important to us. But, we're going in a different direction and we want to make it our own direction." With O'Mahony back, things were finally looking up at Munster. But then, on an autumnal Sunday morning in Paris, their world fell off its axis. The Wednesday after the sudden death of Anthony Foley, O'Mahony and Erasmus sat inside a room full of media at their base at UL. Two days before, it was provisionally decided that Erasmus would speak publicly with a player supporting him at the top table. O'Mahony was the natural go-to man but he was also one of the players who had worked with and known Anthony the longest. When O'Mahony was asked if he wanted to be at the press conference he was adamant on doing it even though he was wrestling with his own grief. He wanted to pay public tribute to a man who had coached him since U-20s. O'Mahony was one of the six men, along with John Langford, Mick Galwey, Peter Clohessy, Keith Wood and John Hayes, who carried Foley's coffin on their shoulders from the gates of the church in Killaloe to the road towards his final resting place. The next day, O'Mahony led the line of Munster players standing in memory of their former head coach at Thomond Park before the game with Glasgow. It was O'Mahony's shoulder that an emotional Simon Zebo turned to after that minute's silence. "We came out here to play like Axel would have wanted us to play," O'Mahony said after the win. "And we played for Olive and the kids and all their families. God, I hope we did them proud today." While the guidance Erasmus has given the province through the toughest months imaginable has been rightly lauded, the South African admitted this week that he couldn't have done it without O'Mahony. "He certainly helped me a lot with all the things that happened off the field. If he didn't know all the stuff behind closed doors," Erasmus said. "He almost thought like a coach and thought for some of the young coaches in the system and that's what impressed me." O'Mahony's temperament and ability to have his team-mates playing at just the right temperature during this turbulent time has been one of the remarkable aspects of his leadership. The squad has had to get on with their job of playing and he's piloted them. In the spikey game against Glasgow last weekend, Conor Murray felt indebted to his captain. "Pete has a really good head on his shoulders in tight situations and having him on the pitch, in particular. He was just a voice of reason at times when a few of us wanted to boil over - he was the guy calming us down," Murray admitted. There have also been moments of O'Mahony magnetism which have illuminated this traumatic season. When he celebrated CJ Stander's try during the recent win over Racing 92 with a pumped-up roar, he made you want to mirror his celebration. That's the O'Mahony effect; he drives himself to operate at such a heightened state and his emotions seem so unfiltered that it makes so easy to understand why others would follow him as captain. O'Mahony will run onto the pitch at Thomond Park today, touch the grass and bless himself. Munster will play for the right to be at home in the Champions Cup quarter-final. And O'Mahony will look to keep Munster going on a direction their former head coach would be proud of.